© 2002, © 2019 by Paul Freeman. Revised 1/27/19. 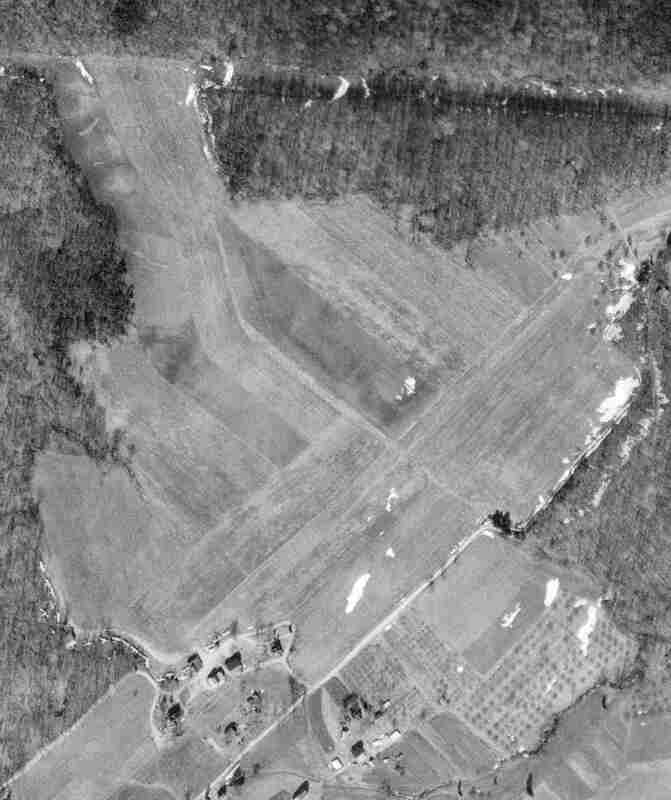 A 3/26/56 USGS aerial view of Spamer Field. 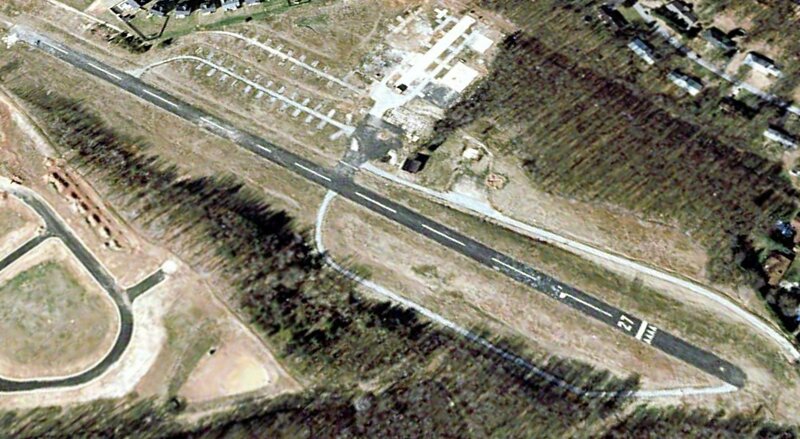 The date of construction of this general aviation field northeast of Baltimore has not been determined. nor depicted on USGS topo maps from the 1940s-70s. 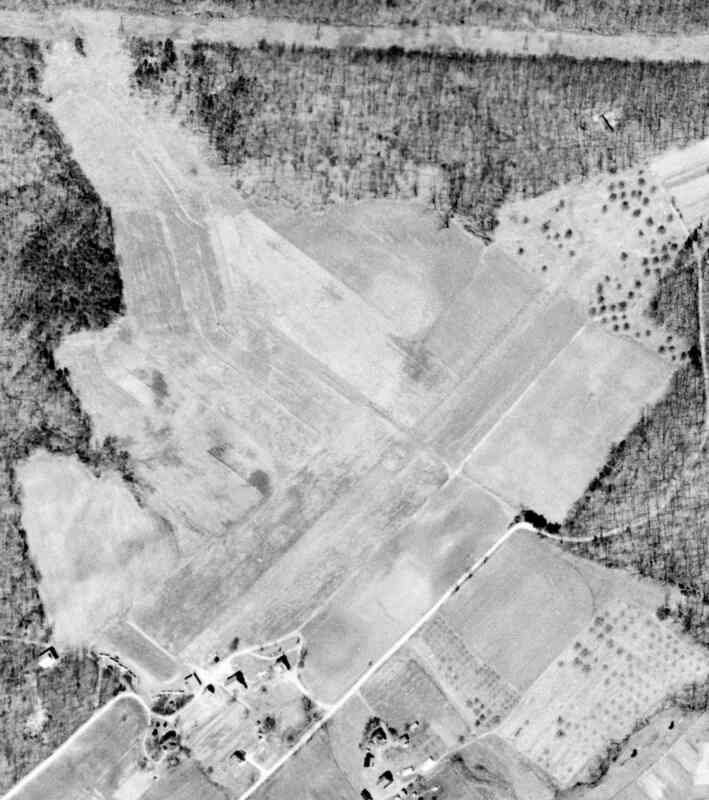 The earliest depiction which has been located of Spamer Field was a 3/26/56 USGS aerial photo. around which were parked 7 single-engine aircraft. However Spamer Field was not depicted at all on the July 1956 Washington Local Aeronautical Chart (courtesy of Tim Zukas). Jay Payne recalled, “Growing up in Perry Hall in the late 1950s & 1960s I remember Spamer Field. There were a couple of hangars & a turf runway. They used to do a lot of skydiving mostly from a gull-winged Stinson. Inexplicably, Spamer Field was not depicted at all on the 1964 Washington Sectional Chart. with a total of at least 18 single-engine aircraft visible parked on the southwest end. A 9/22/70 aerial view showed Spamer Field remained intact. which showed 8 light aircraft on the field. 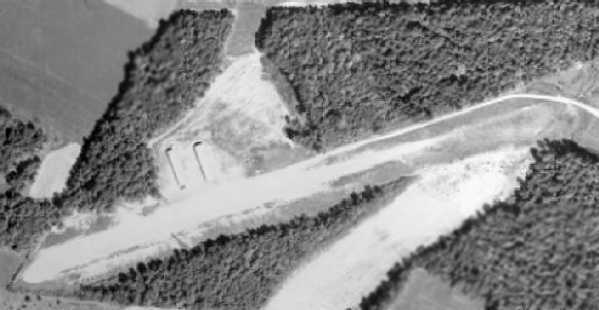 as a 1994 aerial view showed houses covering the site of the little airfield. 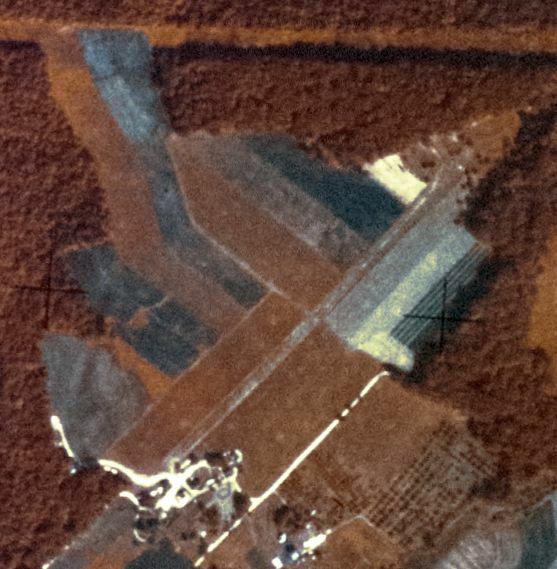 A 2014 aerial view showed no trace remaining of Spamer Field. 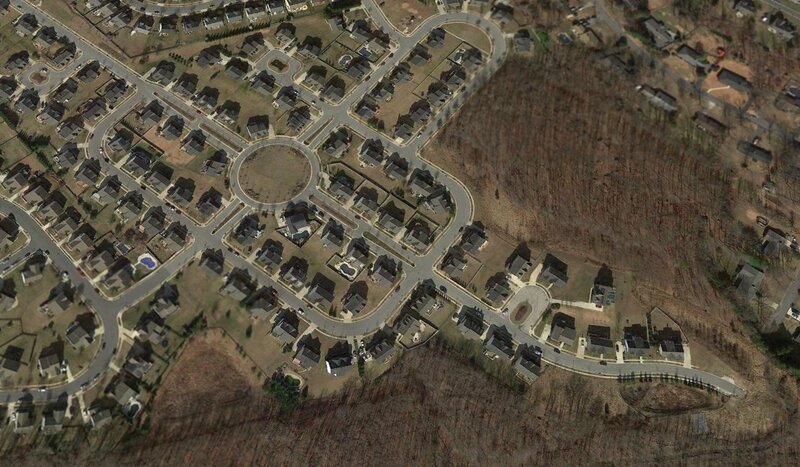 The site of Spamer Field is located at the intersection of Seven Courts Drive & Hickoryhurst Drive. Thanks to Jay Payne for pointing out this airfield. with 2 hangars along the northwest side of the field. as the little airport sat adjacent to the west side of the busy highway, just north of Baltimore. The date of construction of Quinn Airport has not been determined. 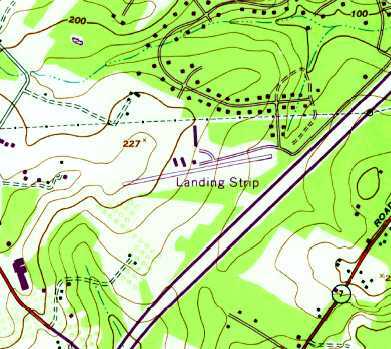 No airfield was depicted at this location on the 1946 USGS topo map. which got it’s name from Frank Quinn who was a local boy in what was at the time a rural community. I didn’t know Mr. Quinn but I hung out around the airport a lot in my younger years. He [Steve's uncle] felt like the strip had actually been there since 1950, but maybe only for Quinn's own use. and had cleared the land for the strip & graded it himself. Frank had a new Piper Tri-pacer & he used to fly with him occasionally. The Tri-Pacer definitely dates the strip to after 1949.
and we were near the airport & saw a guy crash... I believe it was the first person to lose their life there. and he said that Frank (Quinn) had not gotten around to putting down gravel on the strip & it was pretty rough. The plane, a low-wing something came in, touched down, bounced twice & then dug in & flipped over. and since it was a doped fabric, he put his hand through it by accident. He also said he got the prop off of it but had to give it to the accident investigator when he got there. and he is positive that he was still in school when that happened which would date the incident to around 1952.
but what it really was, was rough, hard-packed, rocky, rutted-up clay. 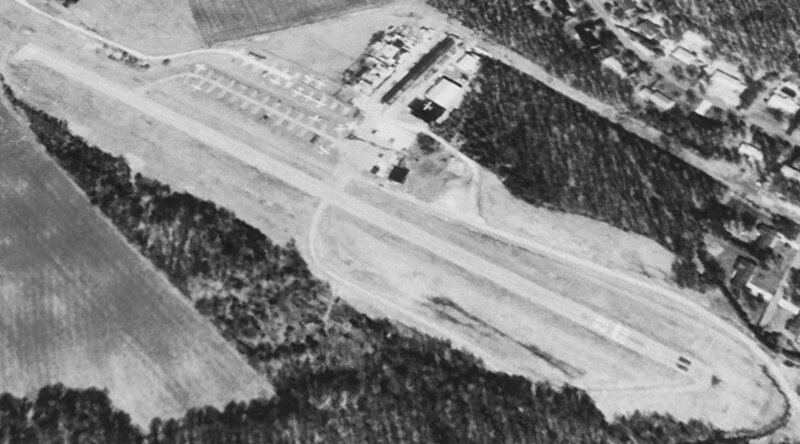 The earliest depiction which has been located of Quinn Airport was a 1957 aerial view. Also note that I-95 had not yet been built along the eastern edge of the airport property. on the 1957 Washington Sectional Chart (courtesy of Mike Keefe) or earlier charts. A circa 1950s photo by Mike Wotovitch of a Monocupe taking off from the unpaved runway at Quinn's. Mike observed, “You can see the 'rooster tail' left by the Monocoupe. Its pilot was probably as relieved as I was to see it airborne. I wonder if he had any regrets at flying such a beauty into Quinn's. The earliest aeronautical chart depiction which has been located of Quinn Airport was on the July 1958 Washington Local Aeronautical Chart. 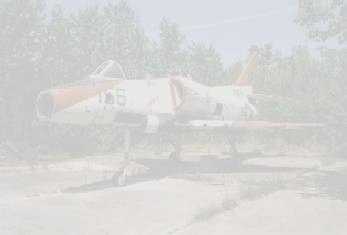 It depicted Quinn as having an 1,800' unpaved runway. Merton Meade recalled, “I used to go into Quinn regularly & it was very rough before it was paved. Steve Hackman recalled, “I used to walk through the airport & look at the planes, and always loved to stand at the end of the runway. This would have been in the 1960s. At the time there were a variety of aircraft there. and a bunch of J-3 Cubs & Taylorcrafts & the like, and of course the regular Piper & Cessna stuff. because the runway had a pretty pronounced uphill slant in that direction. According to the book "Maryland Aloft", a 1962 MD Airport Directory "reported that the airport was operated by Herbert Shanklin. The publication described the 1,800' sod runway as 'rough & rolling'. On the night of 1/17/62 a fire at the airport destroyed 3 aircraft & badly damaged 2 others. The Baltimore Evening Sun named Fred Quinn as the airport's operator in its report on the fire." and I-95 had been built across the eastern edge of the airport property. Quinn Airport was described in an unchanged manner on the 1964 Washington Sectional Chart (courtesy of John Voss). 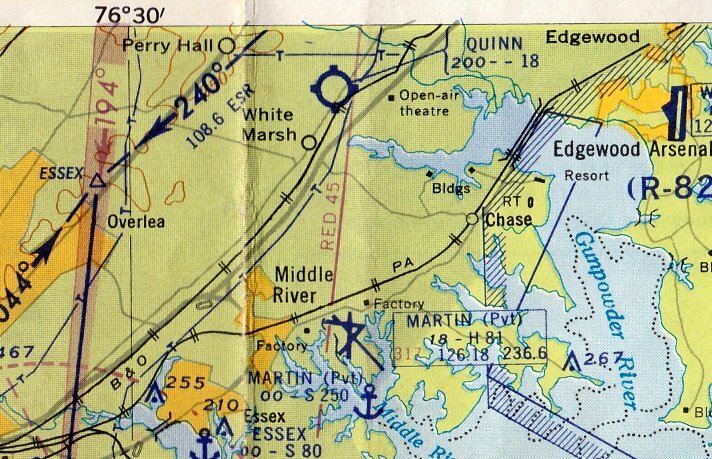 Quinn Airport was not yet depicted at all on the 1966 USGS topo map. Quinn Airport was described in an unchanged manner on the 1967 Washington Sectional Chart (courtesy of John Voss). The 1968 Flight Guide depicted Quinn Airport as having a single 2,000' unpaved Runway 9/27, with 4 buildings on the northwest side of the field. According to the book "Maryland Aloft", “Earl Mace & his wife Betsy paved the runway before reopening the facility in 1968 as Baltimore Airpark. The new owners added hangars & an office building." they moved an enormous amount of dirt to level the thing out but it still had an uphill slant. with I-95 in the background. as having a 2,100' paved runway. with a total of over 40 light aircraft visible on the field. the original unpaved runway had been replaced with a paved runway on a slightly different orientation (oriented somewhat more east/west). and a larger hangar now sat north of the middle of the runway. 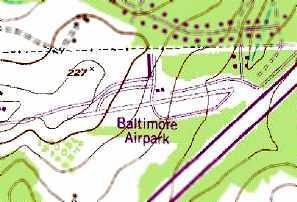 The earliest topo map depiction which has been located of Baltimore Airpark was on the 1974 USGS topo map. It depicted a single paved northeast/southwest runway, with a few rows of T-hangars, labeled simply as “Landing Strip”. 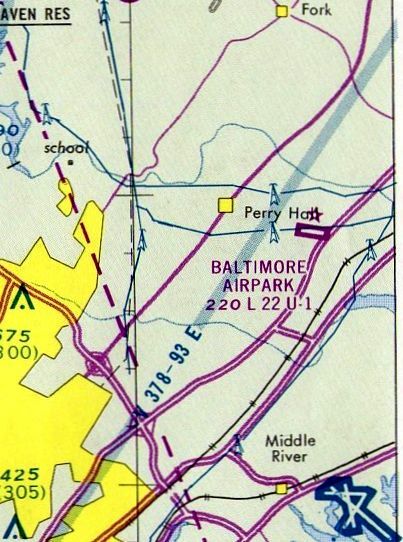 depicted Baltimore Airpark as having a paved 2,200' northwest/southeast runway. showing the proximity of Interstate 95 in the foreground. [Martin Airport had previously been a private field, and was bought by the state & reopened as a public airport]. 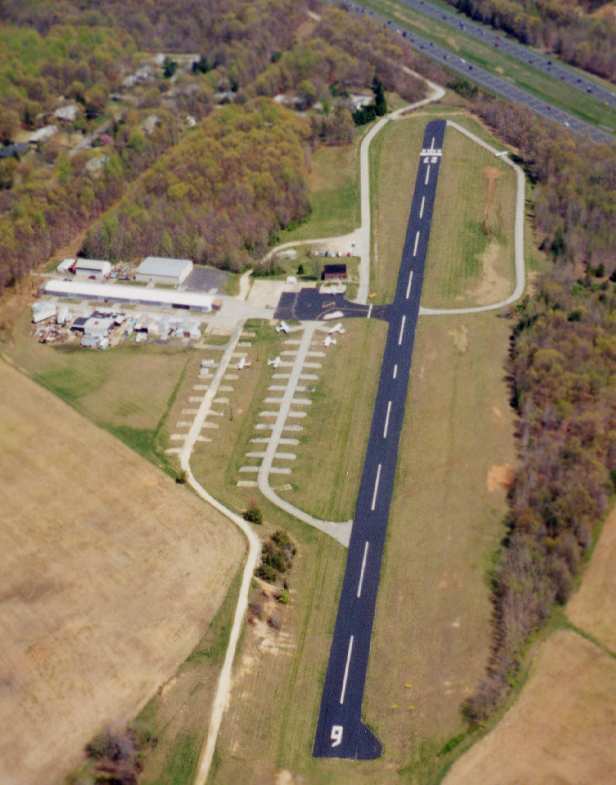 “The new facility attracted pilots seeking a longer runway than the single 2,200' east/west strip available at Baltimore Airpark. The Maces eventually sold the land." Richard Wilson recalled, “Baltimore Airpark... I first earned my tickets there starting in 1975. Back then the runways were 10/28 and were changed to 9/27 when a later magnetic survey suggested the change. I knew Earl & Betsy Mace well. And there were the characters that flew out of there. Joe Zito had an interesting 4-seater 1947 Globe Swift. and it was very loud & distinctive. Richard continued, “Mo (Morris) Barret learned to fly there in the late 1970s. He earned his ticket stem to stern at Baltimore Airpark while he was in his 70s. Mo was the corporate chef for Martin Marietta's corporate research lab. Richard continued, “And there was Tony - the A&P guy. Always complaining about the aircraft from Earl Wilson's fleet down at Essex Skypark. Earl Wilson (not Mace of Baltimore Airpark) had an 'OCD' about birds roosting on the vertical stabilizers of his planes. So he shot at them. And occasionally he missed. Then the planes were flown over to Baltimore Airpark so Tony could patch the little holes in the metal. 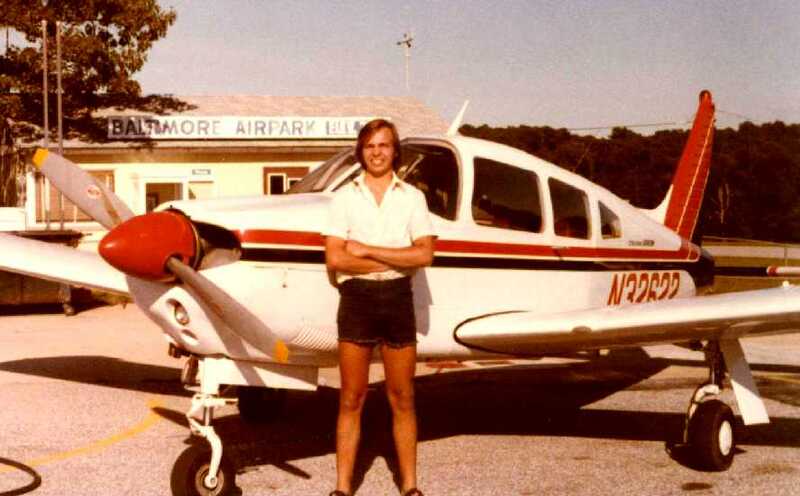 A circa 1976-77 photo of Richard Wilson at Baltimore Airpark, “in front of my favorite rental craft - a Piper Arrow. It was a leaseback to Earl Mace from an accountant who used it to regularly shoot up to Las Vegas to do some work there. you were woken up SERIOUSLY by the leaf/twig slap on the undercarriage & fuselage. Richard continued, “Earl Mace was a character in that he did so much to improve that airport by himself. He even had a big Caterpillar 'pan' - one of those big earth-movers that had the drop-apron to scrape soil, store it, then dump it somewhere else. He used this thing to improve the runways, tiedown areas & taxiways over the years. And he even serviced the diesels himself. I think Earl could do most anything. to fly around on my meager 'hamburger-flipping salary'. and listed the operator as Baltimore Aviation Service. and 3 buildings on the north side of the field. with parallel taxiways running on the north & south sides. 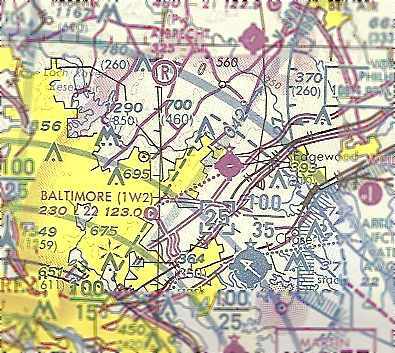 The March 1993 Washington Sectional Chart depicted Baltimore Airpark as having a single 2,200' paved runway. 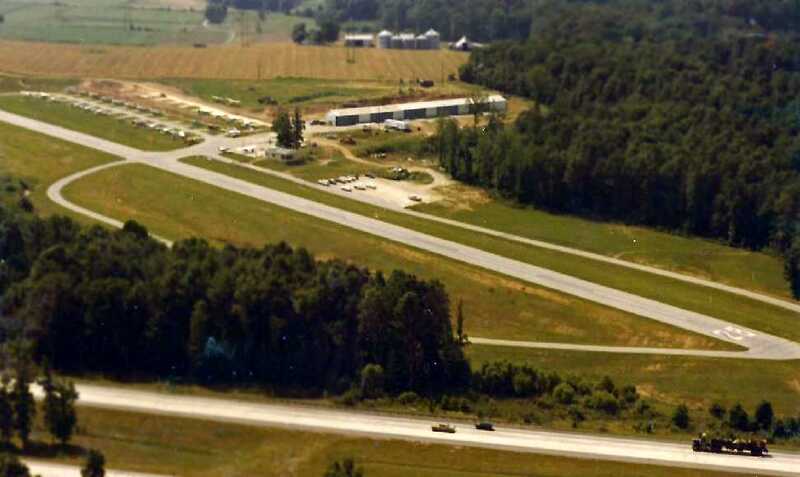 A 1994 USGS aerial view looking northwest at Baltimore Airpark. A beautiful 1998 aerial picture looking east at Baltimore Airpark by Philip K.
The last aeronautical chart depiction which has been located of Baltimore Airpark was on the August 1998 Baltimore Washington Terminal Area Chart. It depicted Baltimore Airpark as having a single 2,200' paved runway. Bill Peters recalled, “I was the weekend guy at Baltimore Airpark. The last 2 years of Baltimore Airpark I cut the grass, took money from students, etc. I was at that airport just about every weekend & almost every weeknight. A video of Citabria 5219X performing a takeoff, 1 aborted landing, and 1 successful landing at Baltimore Airpark on one gusty day. The plane was “5219X... the orange Citabria we had. The last photos which have been located showing Baltimore Airpark still in operation was a an early 2001 photo by Paul Freeman of the Piper PA-28 Warrior he had flown in. An early 2001 photo by Paul Freeman, just before the uphill take off from Runway 27. Paul Freeman flew into Baltimore Airpark in early 2001, just before its closure. with no rental aircraft available anymore. 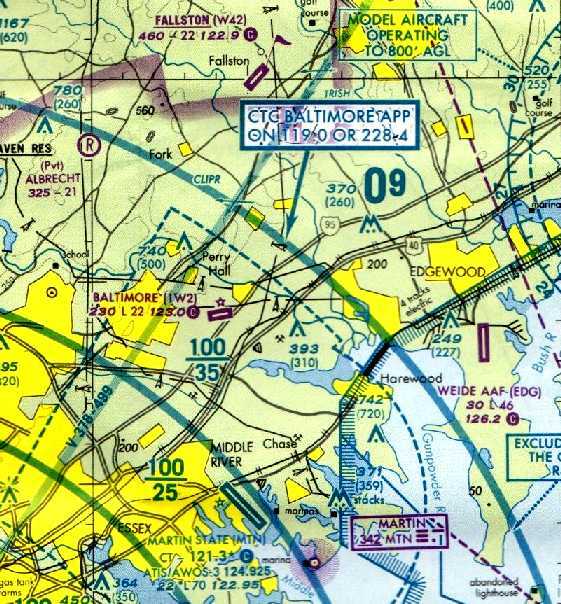 that the approach end of Runway 27 sat very close to the heavily-traveled Interstate 95.
necessitating an immediate call to the MTN tower upon departure from Baltimore Airpark. an office building & several hangars. (on what was already a short runway) when departing on Runway 27.
with the property being redeveloped with more new houses (just what we need). A late 2001 view of the remains of the hangars at Baltimore Airpark, in the process of being demolished. A late 2001 view of the remains of the office at Baltimore Airpark. Compare with the earlier photo taken from the same perspective, less than a year before, when the airport was still alive. A late 2001 view looking west along Baltimore Airpark's former Runway 27, with the reason for the airport's closure visible to the right. A 2001 aerial view looking northwest at Baltimore Airpark, after the field has already been closed & the hangars demolished. to find the airport closed & in the process of being demolished. The hangars were largely demolished, mostly just piles of twisted metal. The airport office still stood, but was gutted, and was filled with nothing but broken glass & trash. 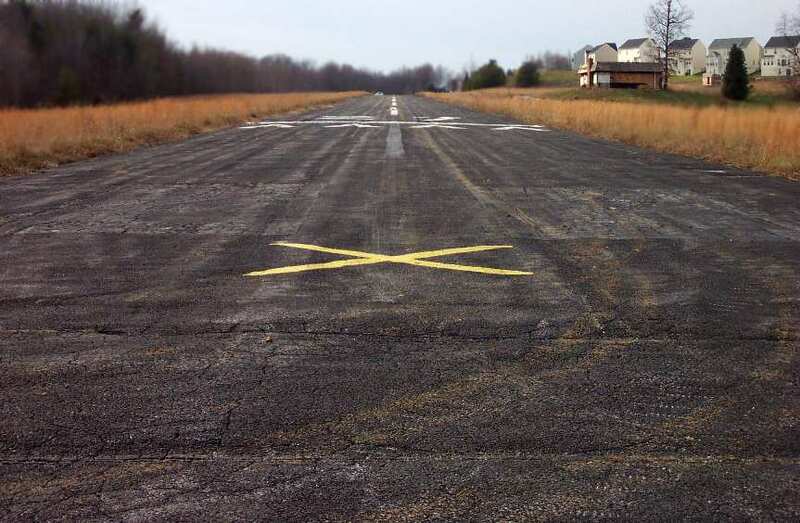 The runway still existed, with closed "X" markings. 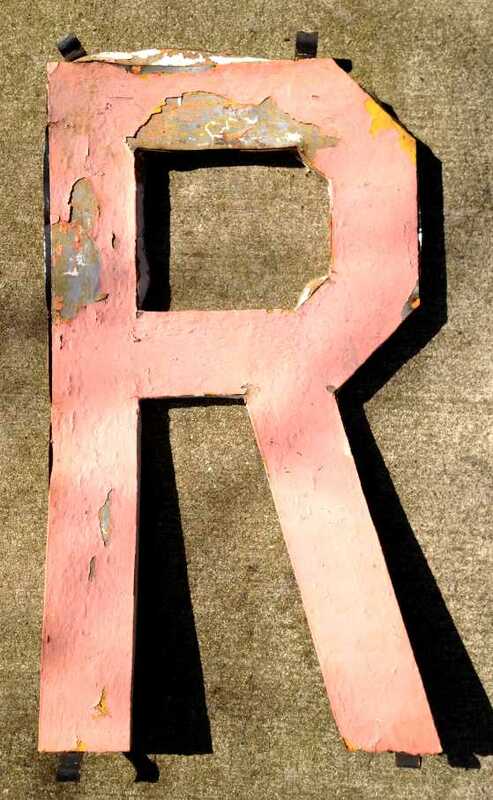 The red metal letters which once spelled out “Baltimore Airpark” along the side of I-95 were piled in a heap of debris. sat right up to the edge of the former airport property. and most of the residents would have no idea what used to exist there. MD pilot Steve Stricker reported that the runway of the former Baltimore Airpark was finally ripped up in 2003.
which is no longer recognizable as ever having been an airport. Yet another small general aviation airport lost forever. which used to be part of the illuminated “Baltimore Airpark” sign which faced I-95 for decades. A 2017 aerial view looking northwest at the site of Baltimore Airpark, showing absolutely no trace remains of the nice little grassroots airport. 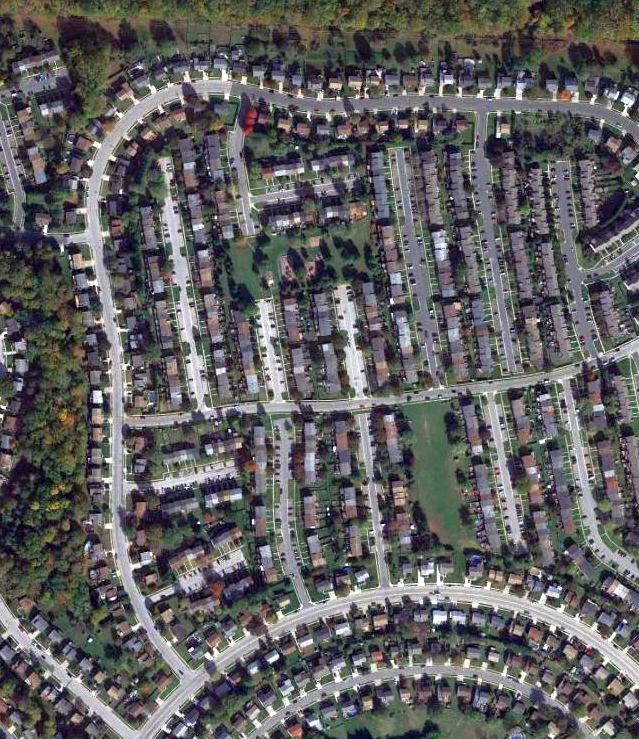 but it now ends just east of the housing development that now covers the site.